Not having to go anywhere and do anything has done wonders for my knitting! 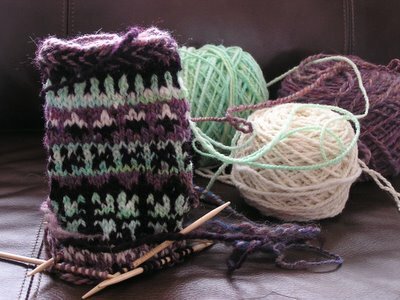 I swatched with my handspun lopi style icelandic single. I'm in love! It will not take long to spin the yarn for this. Although right now I'm really into my socks and sweater. I had to start a new sweater! I know I have two unfinished ones on the bottom of my workbasket but this one is different! 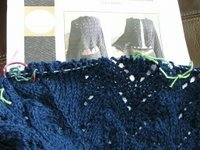 It is a top down lace cardi in Peruvian Collection Sierra Aran in Blueberry. The pattern was free from elann and the yarn with an extra skein cost 25$ It is going very fast because it is aran weight. Also no seaming!!! This is so up my alley! I decided to keep the horsesoelace on the sleeves too. 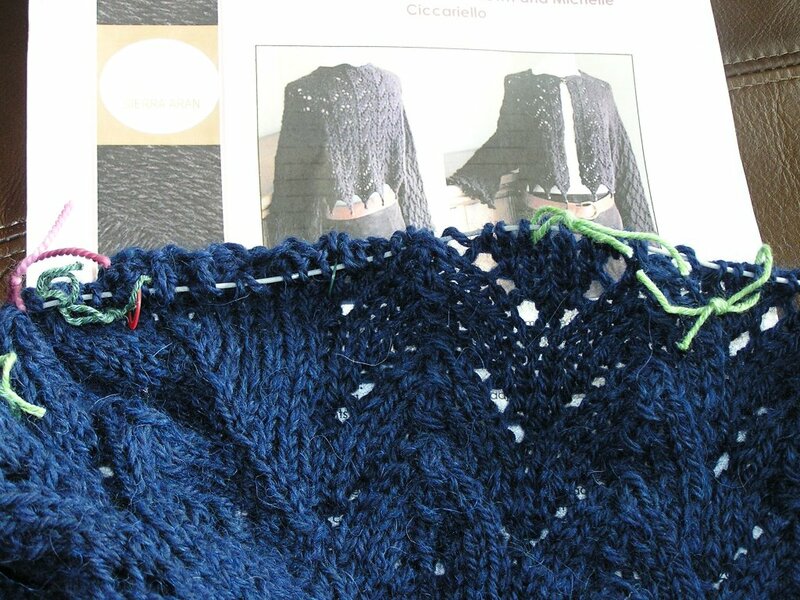 They change to milanese lace and I think I'd prefer the continuity of the horseshoe lace. 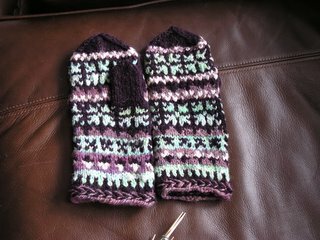 I also finished the handspun mittens. Working with millspun feels very flat now. Life has been throwing some curves for our family practically every December for the last five years. December brings much sadness. It is not a good month for us. Prayers, thoughts, lit candles, any of those are very much appreciated. I thought my daughter would never get the itch. Not because she is so old that she probably won't ask anymore, she's only five. I thought this because I love knitting so much that she is jealous of it sometimes. I thought this jealousy would make her resent it. I never asked her if she wanted to try it not wanting to push in the slighest bit. I was completely wrong. I can't believe what a natural she is. No sweaty gripping. No face twisted in concentration. No impossibly tight stitches. 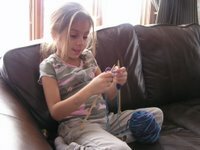 She was whistling while she was knitting! 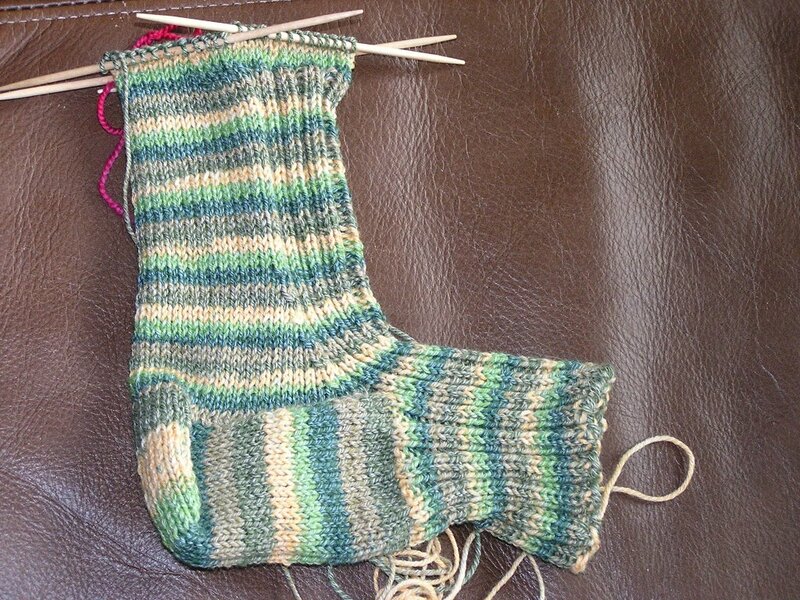 I didn't do this the first time i knit. She's only five. The possiblities. Even though I contemplate the possiblities I still don't push or even ask if she wants to I wait for her to bring her little knitting bag out. This will be the first installment of the sheep breeds spinning critique. I am spotlighting Targhee because it was my favorite. It is soft and spongey and just lucsious. I think it has been my very favorite of anything I have spun so far. 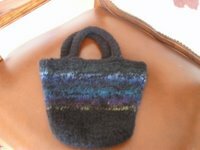 It is a short fine wool. 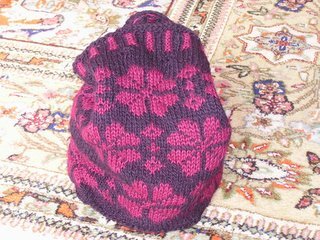 Last week Prudence of Pink Tea suggested handspun mittens. She must have read my mind! It's darn cold here and I thought that would be a great idea. This is out of handspun ,the green is kool aid dyed columbia. 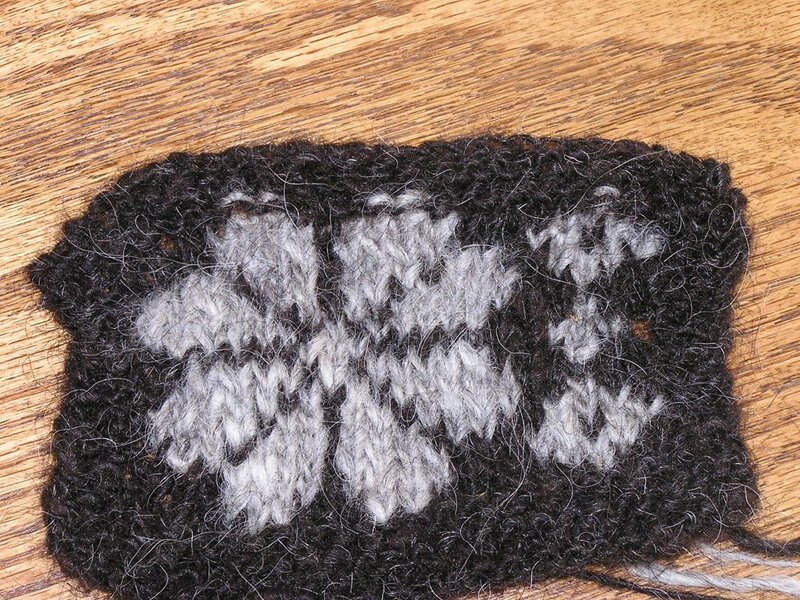 How fun it took me a few days to think of what pattern I wanted. I decided on peace fleece. 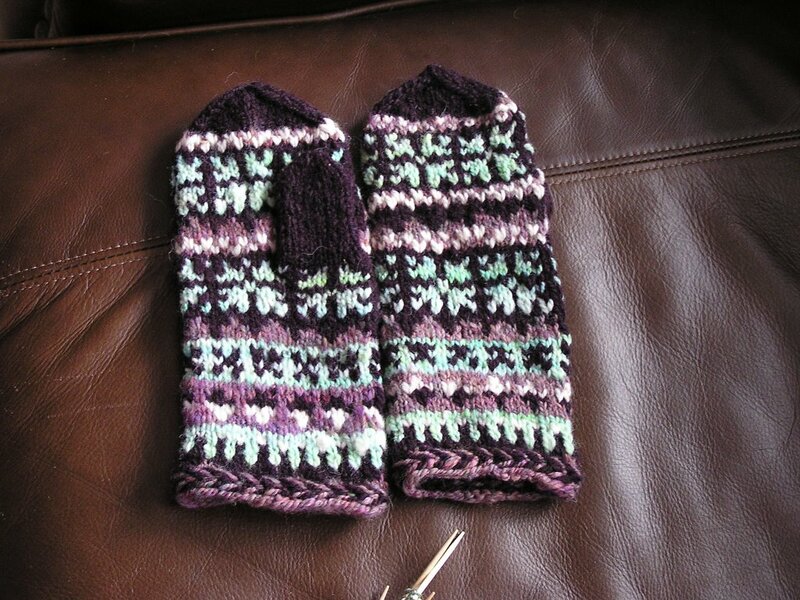 I made a couple of pairs of these a few years ago and loved the pattern. Next time I will start a review of the sheep breeds I have spun. 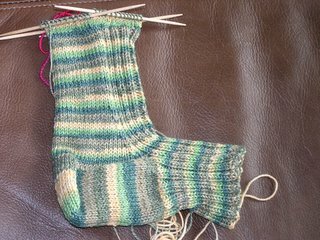 Oh my, the satisfaction I am getting working with my handspun is great! I finished the Christmas Rose bag from Handknit Holidays. The plum is my handspun and the red is local alpaca mill spun. I really didn't think it would knit up so evenly. 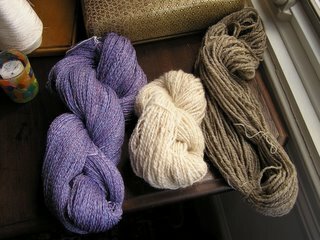 I also spun two small skeins this week. One grey merino x and one shetland. I'm surprised by how much I really liked spinning the shetland. I was trying to spin with less twist and I was sucessful!! This was a much softer yarn though still my beloved worsted. Things afre starting to click. I'm beginning to understand how to get the results I want. 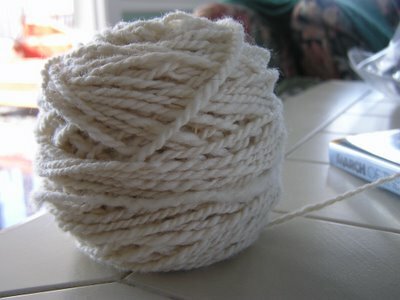 I finally understand the difference between worsted and woolen. I am so sucked into the vortex I may never see the light of day again;-) The purple is the silk merino spun into 846 yds of lacey goodness! 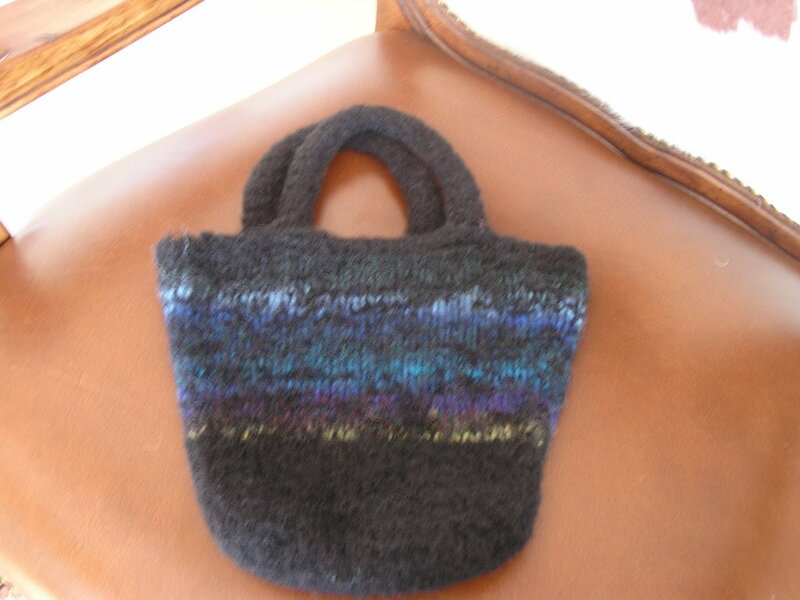 I am so loving working with my handspun. It is just very rewarding. 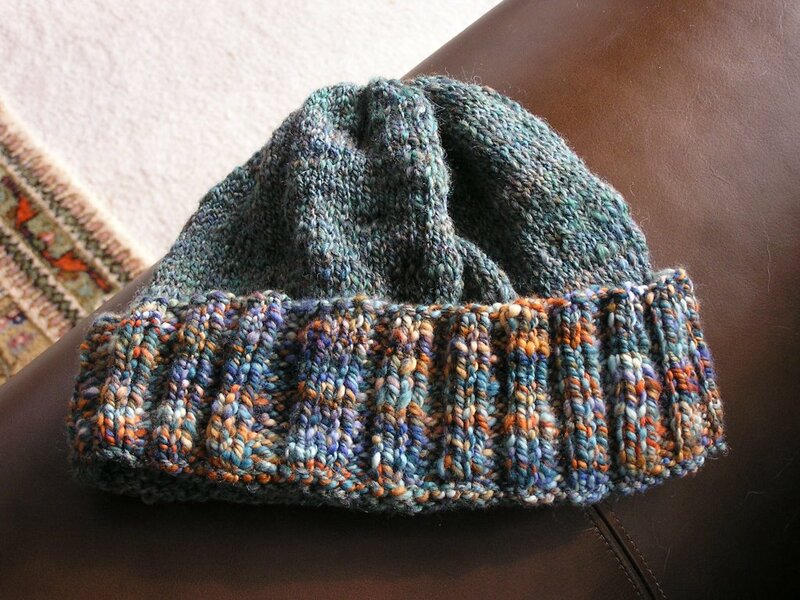 I let my mom pick two skeins of my handspun for a hat and then made it in a day because she needed it and I was having fun knitting it! 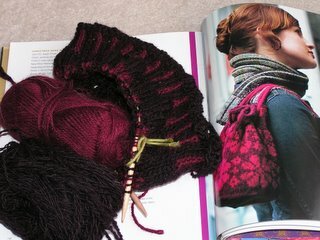 I'm knitting the Christmas Rose bag with handspun plum wool and store bought rosy red alpaca. I'm loving it! 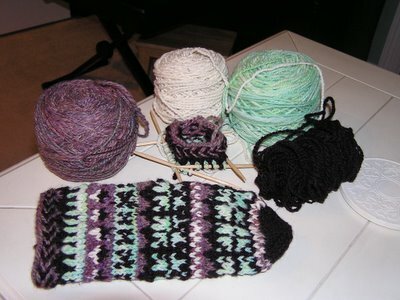 I don't do much fair isle anymore because it makes me a crazy woman. Kind of like koigu. I can't wait to see the next row, and the next row, and the next row... I'm much more calm with lace and other things.